El Portal Sedona Hotel was selected as an architectural masterpiece by “Keep Sedona Beautiful” and is Sedona’s only Arts & Crafts adobe hotel. 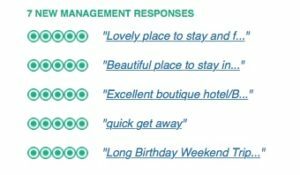 We are not a traditional hotel or resort, we offer a unique lodging experience providing our guests with the comforts of home and the superior services of a four-star hotel at an excellent value. El Portal Sedona Hotel is a luxury inn dedicated to providing an extraordinary lodging experience for guests and their pets. El Portal is a pet friendly Sedona hotel. We were named the Best pet Friendly Hotel by USA Today and 10Best.com! We welcome our four-legged guests as warmly as we welcome our two-legged guests and there is never a fee for pets. 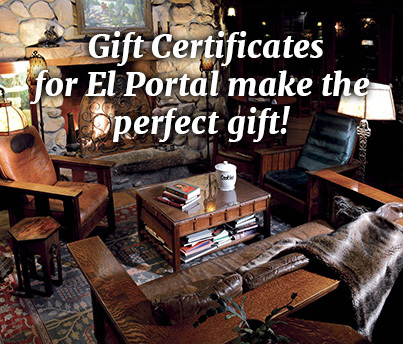 El Portal has a special pet treat basket that includes a blanket, doggie bags and treats. Several of our rooms have outdoor fenced pet patios. Sedona is a very pet friendly city with pet friendly hikes, walking paths, a dog park, and pet friendly stores and restaurants. El Portal is situated in Sedona’s art district, adjacent to the world famous Tlaquepaque Arts and Crafts Village. The boutique hotel is also within walking distance of uptown Sedona, but away from all the noise and traffic. Our guests have access to a full gym, two swimming pools, and spa privileges next to El Portal at Los Abrigados, guests just have to show their room key! Walking paths connect El Portal’s guests to over 16 miles of paved bike and walking paths, and miles of hiking trails. El Portal is the only hotel with full time guides on staff to help guests plan their outdoor activities, pick out hiking trails and explore the Grand Canyon or Indian Country. El Portal Sedona Hotel is dedicated to providing an extraordinary lodging experience for guests and their pets in unpretentious luxury. 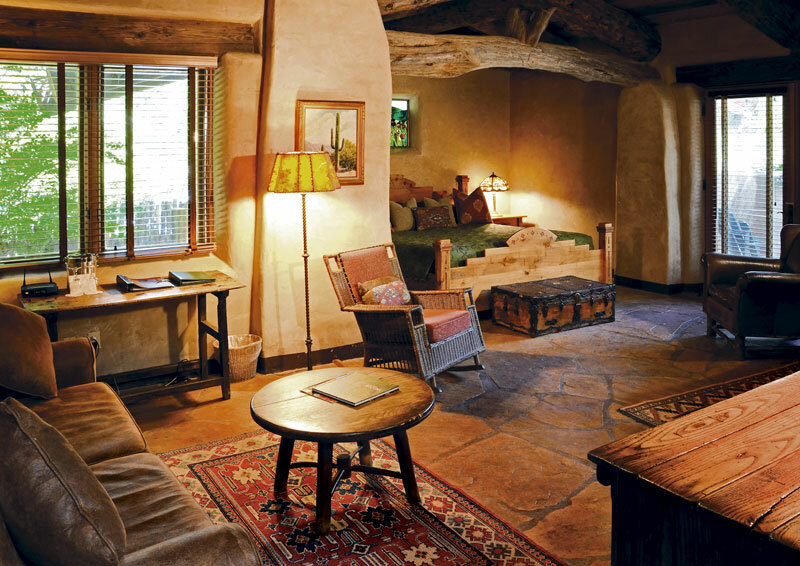 The boutique hotel was designed and built with pets’ needs in mind with tile and wood flooring throughout; while at the same time offering guests the best in modern amenities and unparalleled concierge services for the Sedona area. Why stay at an ordinary hotel when you can stay with us – Sedona Arizona’s luxury hotel? El Portal is centrally located; less than two hours away from the Grand Canyon, close to local, award winning wineries, great hiking trails, Oak Creek, and more. 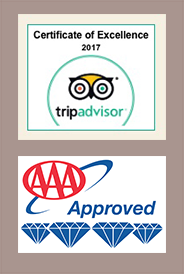 The staff at El Portal can help you with all your daily plans, from jeep tours to balloon rides, shopping, and dining to “doing” the Grand Canyon, we even have special Grand Canyon tours to make your trip extraordinary! El Portal was named Number 2 in 2017 by DOGSTER for the Top Dog-Friendly Hotels in Country, and Number 1 in Arizona! This luxury boutique hotel was picked as one of the eight best hotels in America by Harper’s Hideaway Report, Frommer’s and the New York Times. El Portal is a AAA Four Diamond Hotel, and was voted as one of the Top 10 Hotels in the Southwest Readers’ Choice Awards by Condé Nast Travelers. 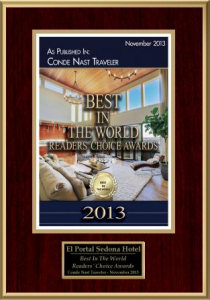 El Portal was selected as a 2015 winner of BedandBreakfast.com’s 11th Annual Awards for B&Bs and inns!